4.91 points at 11 votes (rank 779). There is an energy crisis on Earth! Secret powers have subtracted almost all power from the Earth and bunked in a cave at the end of the world. Proceed in the cave with your agile glider - equipped with strong laser canons - to the energy lamps and shoot at them, to set the energy free again and to save the Earth from eternal coldness and darkness. 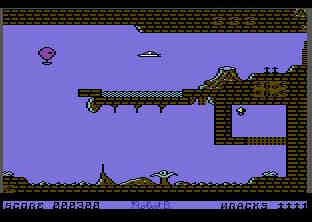 But be careful and watch out for all kinds of obstacles because you only have four gliders for this precarious task! So you fly with a spaceship through an underground cave system and need to beware of different enemies. You need to surmount different moving walls and barriers. Equipped with four ships and a laser you start your journey through the labyrinth. Hereby you need to take care not to collide with your surroundings. In the game you find energy lamps and if you hit them with a laser you can continue your game there if you lose a life. Graphics: Soft horizontal scrolling in both directions. The graphics are kept simple. Sound: The soundtrack of the game is "Axel F." from Beverly Hills Cop. On the lower left side of the screen your score is shown and on the right side your ships. Unfortunately, the game has no highscore list. In this game you need a "calm" hand to control the ship and move skillfully through the labyrinth. To positively finish the game, all 25 energy lamps need to be shot (order is unimportant). After a short message "Congratulations! You have saved the earth! Greetings from Robert B. to you! The game is now over! Thanks for playing!" has been shown, the game starts anew. The ship follows the horizontal movement (not the vertical) of the joystick with a short delay (10 frames) and keeps moving although the joystick is in neutral position. This aggravates the controls immensely. Therefore you need to pull the joystick into the opposite direction to stop. This requires some practice. There is not time limit, therefore act very carefully and memorise the obstacles in detail. Never pull the joystick into a horizontal direction for too long, as the ship will speed and thus need more time to brake. Erwin33: "The game was on my Power Pack at that time. 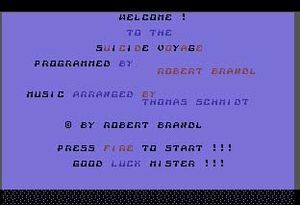 Suicide Voyage is a "dandy" skill game. I also liked the sound of the game a lot at that time. 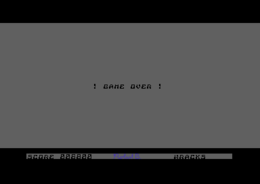 A C64 version of a classic "Axel F." I give 5 out of 10 points. 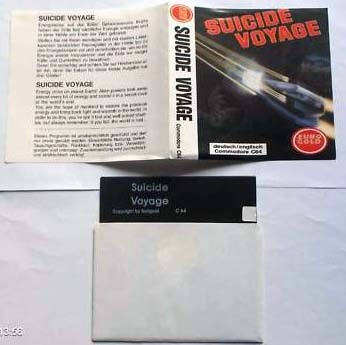 TheRyk: "I also found this one in a collection which was sold as bundle together with the C64 and disk drive. 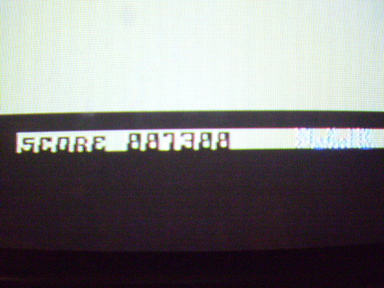 Due to the rather well-done Axel F music I loaded and played it quite frequently. But in the end, nostalgia put aside, it's unplayable. The pixel-exact navigation in combination with sensitive speed control and the delayed thrust reversal makes it simply too difficult, to avoid explicit language. Also the good music and the soso graphics can not compensate for the poor controls, so that I must label this one a poor or even failed Killerwatt rip-off whose makers stole a lot but brought very few own ideas. Maybe Killerwatt experts like this one if they find the original too easy. I rate it 3 points." This page was last modified on 7 November 2015, at 23:17.